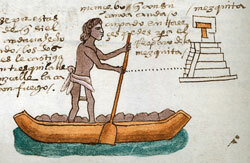 Early Spanish writers commented on the fact that the lakes all round the Aztec capital were peppered with canoes of all shapes and sizes: carrying goods to and from the city (and especially the great market at Tlatelolco), removing waste, ferrying warriors and raiding parties and - as in Venice - doing many of the every-day transport jobs now carried out in cities by buses and lorries. River/lake/canal transport is - as the English discovered hundreds of years ago - a very efficient means of getting goods from A to B. In a society without wheeled vehicles or draft animals, the canoe played a crucial role in moving heavy loads. Indeed, the growth of Tenochtitlan and Tlatelolco into one of the world’s largest cities was certainly due in part to the huge success of the fast-moving, largely water-bound, traffic to and from the main market. And the island location had advantages too. From effective defense to a transport system based largely on canoe-supplied provisions, ‘the lake offered far greater transport efficiency than did land routes, in terms of movement of goods to and from the city’ (Professor Susan Toby Evans). Much of the transport took place at night, to avoid the heat of the day - it’s well known that the market at Tlatelolco was open 24/7, with its numbers swelling from the 40,000 average to as many as 60,000 on each (fifth) major market day. Most general-purpose canoes - those depicted in codices -averaged 14 feet in length, were dug out from a single tree trunk and with upturned ends, and were propelled by wooden pole (or paddle). It took about a week for a skilled carpenter to make a canoe from scratch, and it could cost the equivalent in the market of a single fine cotton cape. 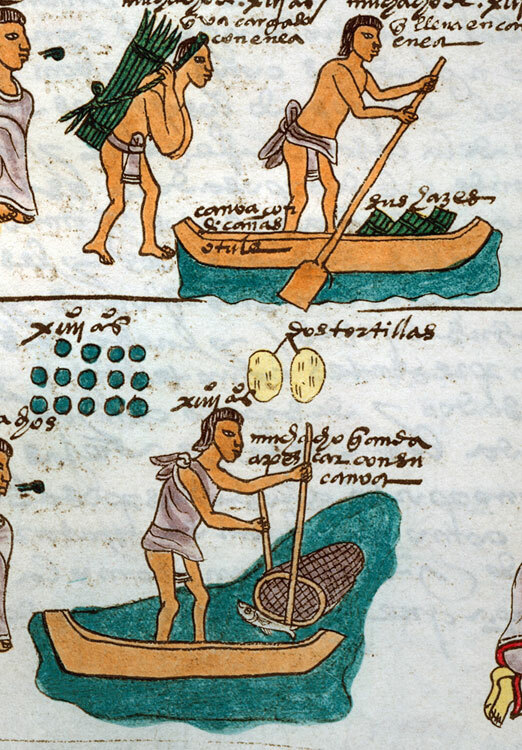 The Florentine Codex records the skill of the ‘water folk’ who made their living from the lake - which was not without its dangers (strong, treacherous winds and whirlpools were common: the most dangerous winds to the boatmen were known to be the northerlies and southerlies). 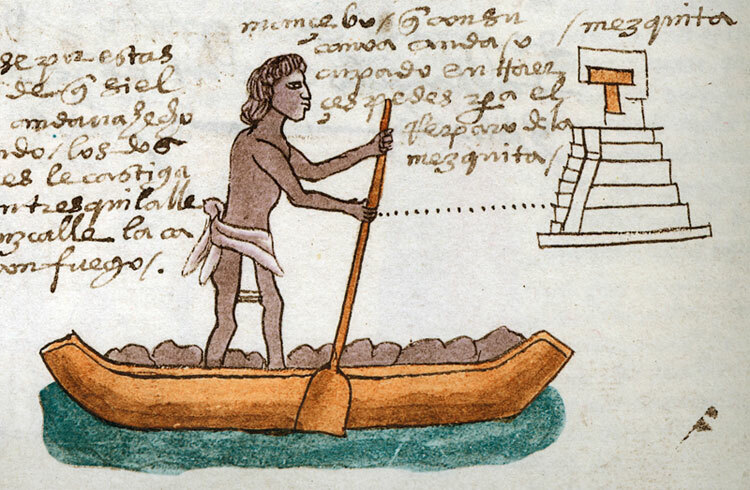 The Codex also notes that the Aztecs attributed the invention of the pole for propelling boats to the god Opochtli, an aspect of Tlaloc, the rain god.